Chabad-Lubavitch opens in Cancun, Mexico. In a decade of living in the Mexican tourist hub that is Cancun, Samuel Rovero, 40, has dedicated much of his time to building up the local Jewish community. He helped found the community center in 1997, and two years ago, served as president of the 200-strong community. But there was still something missing for Rovero: the presence of a rabbi, the kind of central authority the businessman remembers anchoring the tightly-knit Jewish community in his hometown of Guadalajara. So when reached on the day a new rabbi arrived from New York, the married father of two was understandably elated. 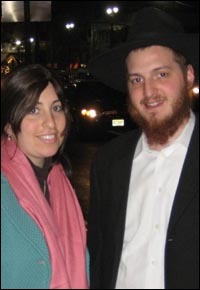 "We're very excited," Rovero exclaimed, hours after picking up Rabbi Mendel and Rachel Druk and their 8-month-old daughter Mushka from the airport. "We believe that it is better for the community to have a spiritual and religious authority. "Without a rabbi," he continued after a pause, "it cannot be the same." Rabbi Mendel (r) and Mrs. Rachel Druk moved to Cancun this week. Almost every aspect of the Druks' move last Monday from an apartment in the deeply pious Crown Heights section of Brooklyn, N.Y. to a part of the world known for tequila shots and Spring Break bashes is noteworthy. Indeed, in an age when stories of Mexicans living in America capture all the headlines, that an American family of three would pack up all their belongings for a permanent move to a place that just 40 years ago was a jungle might well be considered counterintuitive. But such is the Druks' devotion to reaching out to Jews, wherever they may be found, and making them proud of their heritage. "It feels like a whole new beginning," said Rachel Druk, 21, who grew up in Crown Heights, an enclave of Chabad-Lubavitch Chasidic Jews. "It's exciting that this is what we're going to be doing for the rest of our lives." The Druks’ move and the establishment of Chabad of Cancun is seeded by a grant from prominent philanthropist Sami Rohr of Bal Harbour, Fla., who funds projects worldwide that spur Jewish communal growth. "We're a little nervous," Druk went on, in between some last minute packing while her eight-month old baby, Mushka, cried in the background, "but we know it'll turn out very good, with the help of G‑d." Druk explained that her confidence was rooted in the knowledge that she and her family were fulfilling the directives of the Lubavitcher Rebbe, Rabbi Menachem Mendel Schneerson, of righteous memory, to inspire fellow Jews wherever they may be found. From his Brooklyn headquarters, the Rebbe sent out thousands of emissaries to all corners of the globe before his passing in 1994. Since then, thousands more like Druk and her husband, have taken up positions in such far flung locales as Vladivostok, Russia and Vietnam, and all places in between. Now including, of course, Cancun. "Cancun is very unique," began Mendel Druk, a 25-year-old native of Detroit who most recently was the teen director of the Rohr Jewish Learning Institute, the world's largest institute of adult Jewish learning. Before that, apart from his ongoing yeshiva education, he served stints in Berlin; in the Chabad-Lubavitch movement's search-and-rescue response to Hurricane Katrina in New Orleans; and as part of a response team to the 2002 Tsunami that devastated Southeast Asia. "There's an island and a city that are connected by a bridge," he continued in describing his new home. "The local inhabitants are separated from the tourists." So while college kids, a good portion certainly Jewish, are imbibing at the nightclubs, a 13-year-old boy might be doing some last minute preparations for his bar mitzvah the next day. And the Druks' shlichut, the Hebrew word for mission, is to serve both and the communities they represent. A tall order, by the rabbi's own admission, but even before permanently moving there, the Druks had some early successes. For Purim, the Jewish holiday commemorating the victory of the Jews over a Persian plot to destroy them, as told in the book of Esther, the husband-and-wife team decided to throw a big party, complete with the traditional reading from a scroll of the Esther story. The day fell smack dab in the middle of Spring Break. "We made the arrangements from New York," related Mendel Druk. "We prepared for many people, but in our hearts and minds we figured that about 40 would show up. "More than 100 people came," he went on. "For a first program, it was beyond all of our expectations." The Druks' plans for community-wide Rosh Hashanah and Yom Kippur services in a hotel this fall have equally struck a chord with the locals. "Already we have 30 reservations," said Mendel Druk shortly before departing New York last week. "Not a day goes by when we don't get e-mails from people – and we just made our site live a short time ago." The Druks maintain a website, JewishCancun.com. Still, it's the day-to-day interactions Druk is putting his faith in, he said. Having already gotten a taste of it during his visits to Cancun over the past year, he stressed the importance of meeting as many people as possible, and finding out exactly what they needed at the moment. "We've met some very diverse crowds," said the rabbi. "There's some Spanish Jews from Mexico City, Israelis, Canadians. There are a lot of people with time shares. "I was told by a community member to check out this one island, Isla Mujeres, where there are some Israelis," he continued. "The problem was we had no idea how to find them. So we're walking down the street and are passing a restaurant when a guy comes out and yells, 'Shalom!' This was a place where Jewish people hung out. And during the next two or three hours we met quite a few. Some of them, I can't tell you when the last time they saw tefillin was." For those men in the restaurant, Druk provided the opportunity to put on tefillin, ritual prayer boxes containing scrolls of verses from the Torah that are then wrapped on the arm and around the head. For others that day, Druk placed a mezuzah on their doorposts, fulfilling the biblical commandment to affix a box containing a specific Torah passage on the side of a doorway. Rachel Druk has plans of her own. A trained educator, she said that she wants to begin a monthly women's group and classes for children. The only problem remaining for the Druk family are the simple matters of housing and language. Neither of them speak Spanish. They'll be staying in a hotel for the time being until they find a more permanent place, said the rabbi. And as for the language barrier, Rovero wasn't fazed. "He's a very enthusiastic young man, full of life," he said of Mendel Druk. "A lot of people speak English here. But he'll learn." Rabbi Joshua Runyan is the news editor of Chabad.org.